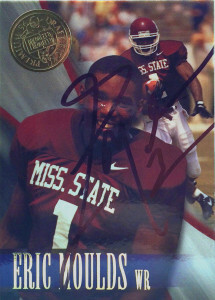 Eric Moulds was an exceptional receiver for the Mississippi State Bulldogs during his time there at the college. At the time of his departure from the school, he was their all-time leading receiver with 17 career TDs. He also set the single game school record with 15 receptions against the Volunteers. Overall he played in 31 contests and had 118 receptions for 2,022 yards and 17 TDs. The 1996 draft was one of the deepest receiver drafts in modern memory. Among the other names in this draft were: Marvin Harrison, Terry Glenn, Keyshawn Johnson, Amani Toomer, Mushin Muhammed, Eddie Kennison, Joe Horn, Terrell Owens, and Jermaine Lewis. The Bills drafted him at 24th overall, and he’d bide his time as the heir apparent behind future HoFer Andre Reed playing on special teams. 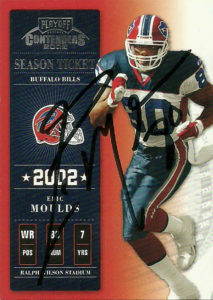 In 1998, Eric became the face for a new generation for Bills fans with a breakout season. Starting 15 games he made 67 receptions for 1,368 yards, a gaudy 20.4 yards per reception and 9 TDs. (His 1,368 yards led the AFC.) While the team experienced inconsistency at quarterback, Moulds continued to produce, and was named to the Pro Bowl again for his 2000 and 2002 campaigns respectively. Notably his 2002 season would be the first time any Bills receiver recorded 100 or more receptions. By 2005 Moulds contract numbers were reaching over 10 million a year for a 30+ year old receiver. The Bills and Eric came to terms that it was time to move on and traded him to the Texans for a 5th round pick. Eric chose the Texans over the Eagles because he wanted the opportunity to play alongside upcoming receiver Andre Johnson. It seemed to be a win/win situation as the Texans also wanted Moulds to bring a veteran presence to the wideout corps. I remember being extremely excited about this move. It was a time of transition for the Houston Texans. Gone was former coach Dom Capers, but the remnants of Charlie Casserley’s decisions were still there in quarterback David Carr. The Texans hoped that Moulds could take pressure off of Johnson, who was drawing double and triple teams from defenses, but things didn’t work out that way. He finished with 57 receptions for 557 yards and a career low 9.1 yard average. In 2007 the Texans decided to reshuffle their receiver corps. With free agent Andre Davis signed, Kevin Walter starting to come into his own, draftee Jacoby Jones in the fold, and David Anderson making noise, the writing was on the wall for Moulds. He’d be cut ending his brief tenure with the Texans. The always receiver needy Titans kicked the tires and decided to bring Moulds in. He started 8 games for Tennessee in 2007 recording 32 receptions for 342 yards. Moulds is still remembered fondly by Bills fans. Perhaps if his career didn’t straddle over the late 90s and early 00s, on such bad teams with quarterback issues, he’d also be regarded with much more fanfare throughout the league. Still- Eric made an impression with the Bills faithful and was honored by Buffalo as a member of their 50th Anniversary Team in 2009. I hoped that way back in 2012, Moulds would be my first success of the year. Unfortunately I got an RTS instead. I bode my time until he resurfaced this year and shot out the cards again and surprisingly got these great autographs back in 12 days flat.